Contracts of Employment (sometimes referred to in other EU countries as Contract Employment) are between the employer and the employee. 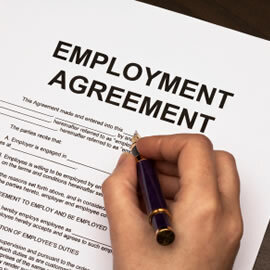 They outline the rights, responsibilities and terms and conditions of the employment. Both the employer and employee have a duty to abide by the contract or face the consequences of breach of contract. It is important to know that the legally binding terms of the contract do not have to be written down, they can be orally expressed and/or implied. These are equally binding. An example of an implied term is for the employer to provide a safe working environment. If the contract is to last three months or longer, the employer must write a statement of employment particulars with the main terms and conditions and provide it to the employee. There is a strict list of necessary information which must be included such as pay and hours of work. Employers will typically make claims against employees because of breach of restrictive covenants or breaches of one of their duties. For example, it would be a breach of contract if the employee was stealing from the company. There are many other reasons why employers make claims and it is often to protect the rights of the other employees. If you need advice on your Contract of Employment, please contact us. Our team of experts will listen to your queries, advise you accordingly and if necessary, take you through the procedure process step-by-step to make sure your claim runs as smooth as possible.